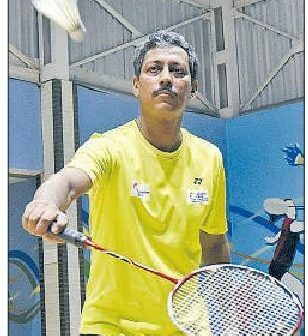 A 50-year-old badminton coach from the city is the only one from Bengal in a 248-member Indian contingent that will take part in the World Senior Badminton Championship in Poland this August. The tournament is meant for badminton players aged 35 to 70. 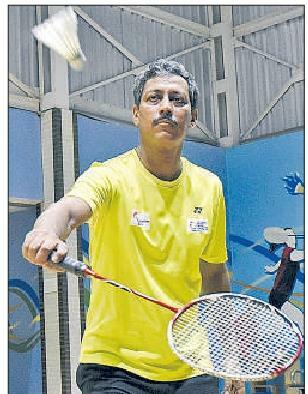 Sanjay Ray, the chief coach of a badmintontraining institute in the city, will compete in the 45 to 50 age group. The 5ft 10-inch soft-spoken railway employee won’t stand out in a crowd, but he is a changed man on the badminton court. There is a firmness in his voice as he instructs his students and he won’t let a student take a break till the right smash is achieved. Ray was selected in the men’s doubles category for the world championship after he finished runner-up in the men’s doubles 45 category at the national championships in January. “This is the third time I will be representing India in the World Senior Badminton Championship,” Ray said, in between training a bunch of young boys and girls. Ray had reached the semi-finals in the 2013 championship. The interest in the game was born in his childhood, when Ray’s family lived in Malda. His father was an engineer in the irrigation department Sanjay Ray during practice. Picture by Sanat Kr Sinha and the colony they lived in had a badminton court where two state-level players often practised. “I learnt the game from them,” Ray said. As a player, Ray never represented Bengal or India in sub-junior or junior categories, but his students have played for the state and the country. In 2007, Ray completed a six-month certificate course in coaching from the National Institute of Sports. “It made me a certified coach. I am now eligible to be considered for coaching the state,” the Eastern Railway employee said. Among his students is Sheshadri Sanyal, who has represented India. “We are very happy with Sanjay’s achievements. He has represented Bengal in the veterans category for many years and also represented India,” said Sekhar Biswas, the secretary of West Bengal Badminton Association. Ray will play alongside Rajesh Sekhar from Kerala, with whom he came second in the men’s doubles category in the national championship for veterans in January. The coach in Ray sees greater interest in the game among schoolchildren –the effect of P.V. Sindhu and Saina Nehwal doing well in the international arena. But Ray pointed out the approach towards the game is different in south India and Calcutta. “In places like Hyderabad kids come to do well in the sport, but here education is top priority while badminton comes only second,” he said. Ray said there are only a handful of good courts in Bengal where players can practise. “The premises of the office of deputy commissioner of police (south) on Park Street has the best practice court in the city now. It is made in a way that the players don’t hurt their knees when they land after a jumping smash,” he said..